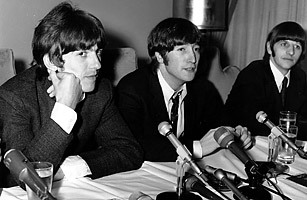 John Lennon's 1966 comment that the Beatles were "more popular than Jesus Christ" stirred so much controversy that it took the Catholic Church 44 years to forgive the band. Lennon didn't mean his comment literally, of course. In 1966, the world had a full-blown case of Beatlemania, and Lennon was simply exaggerating its reach to make a point. In April 2010, the Vatican's newspaper, L'Osservatore Romano, offered the rock-'n'-roll icons complete absolution. Um ... thanks?